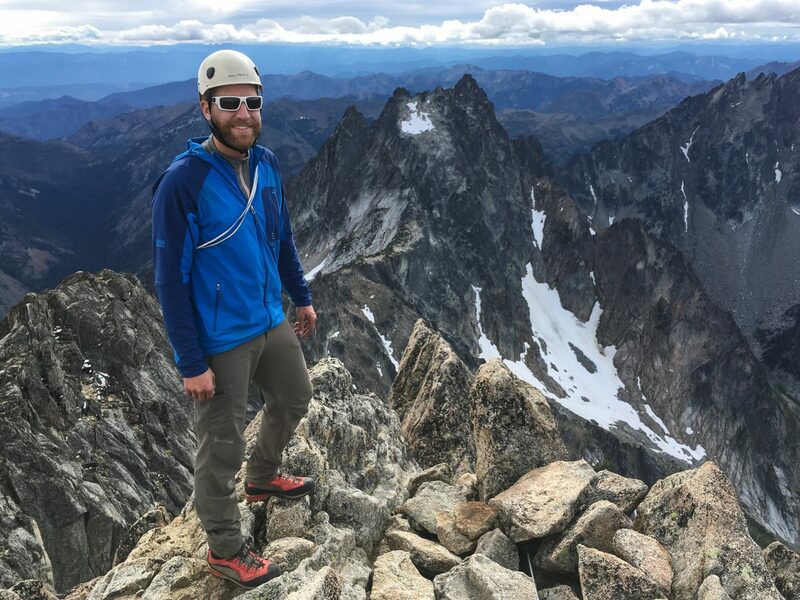 Eddie Allison and I climbed the NW Arête of Argonaut over Labor Day weekend. 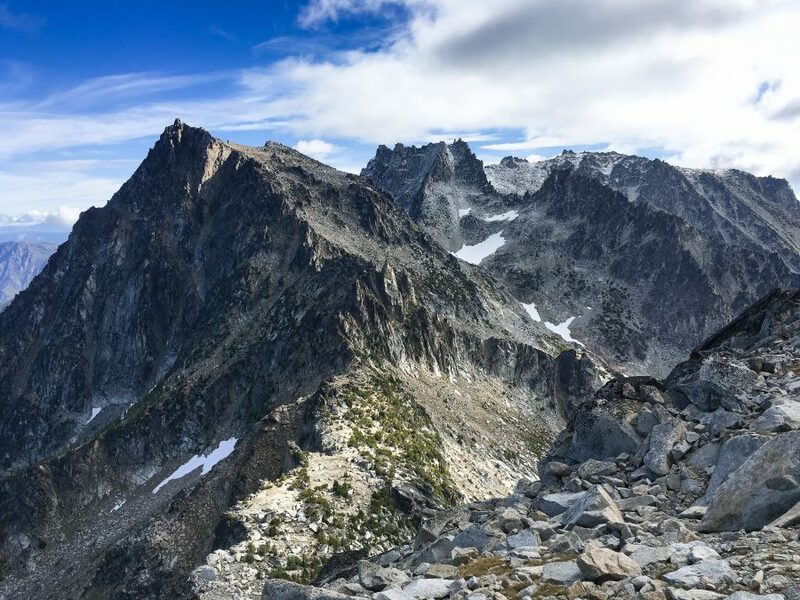 We originally planned to climb in the North Cascades but the weather forecast called for snow and rain, and the Stuart range looked like it would be dry. Argonaut isn’t very popular, which would afford us a climb in a true wilderness setting near an otherwise popular area. While we had an interesting adventure and were able to discover an alternate late season approach, we did not avoid wet and snowy conditions. 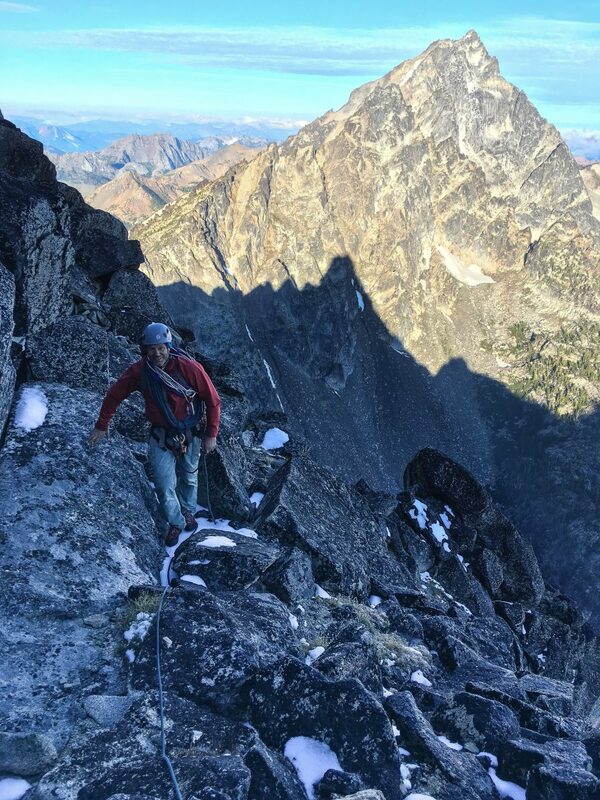 By taking a “leisurely 3 days” for this objective, we hoped to loop in a scramble up Colchuck and Dragontail after completing Argonaut. Nature would have other plans for us though. Our approach began from the Stuart Lake/Colchuck Lake trailhead. We arrived mid-morning since our first day would only entail the approach hike to the start of the climb. The hordes of hikers were out in force and the trailhead parking was crazy. Fortunately, our objective would take us far from the crowds and we found some solitude for the rest of our 3-day journey. Two miles up the trail we took a right at the junction towards Stuart Lake. A half-mile past this junction we entered a meadow-like marsh. There are a few footpaths that head left from the main trail and out into the marsh. We were looking for the “faint climbers path that runs on the west side of Mountaineer Creek.” It took us an hour of wallowing in the mud and brush to finally give up looking for said path and just follow the creek as best we could. It was around this time that it began to lightly rain. We stayed mostly dry since we were hiking in the understory of the forest. Periodically we would stumble upon a faint trail, which usually petered out after a hundred yards or so. Eddie and the view of Argonaut from the meadow just off the Lake Stuart trail. It took us around 2 hours of travel up the creek from the meadow to arrive at a large boulder field. Across and uphill from the boulder field is the wall of slide alder that we had read about. Previous trip reports recommended a rightward traverse, staying low among the boulders to avoid the heinous bushwhack. We took this advice, and it proved to be mostly true. There were intermittent cairns which we followed for a bit. We decided to continue traversing rightward and slightly uphill, staying within earshot of Mountaineer Creek. We wanted to fill up on water and felt that the creek was our last sure chance for this. The slide alder was eventually unavoidable and we did some thrashing about in the trees, fighting our way uphill. The rain seemed to increase as we headed up to higher ground. We were fully exposed to the clouds dumping above us. Our spirits were getting damp and we wanted to make camp soon. Eddie and I had a disagreement about the route for the approach at this junction. I gave in and we continued upward and right. 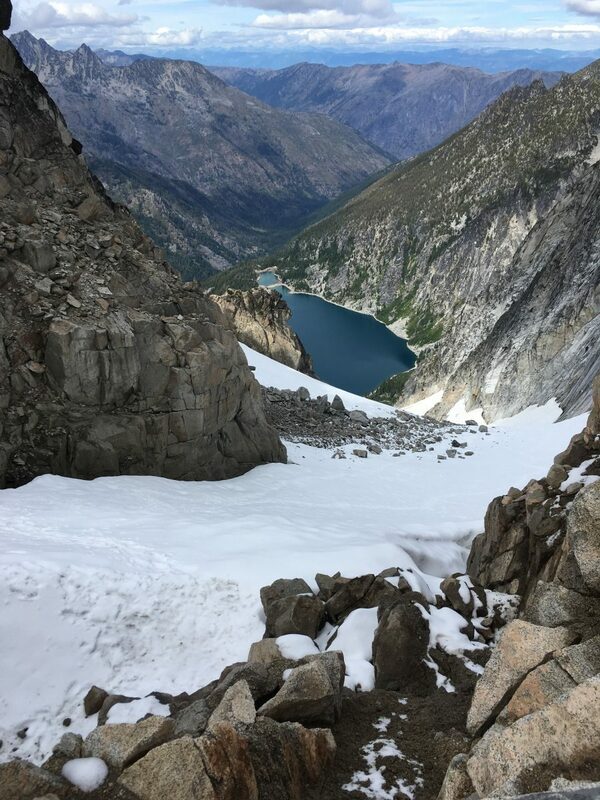 This led to a couloir/gulley system that we hoped would take us up and over a small ridge, then back down to Mountaineer Creek again. We topped out on the ridge and could see that a short descent would take us to a small sandy basin where we could make camp. We found running water here as well as large boulders under which we could take shelter from the rain. Fortunately the rain stopped, and we were able to pitch the tent and begin drying out our soaked gear. We found some dry wood under the boulders and made a small fire, which lifted our soaked spirits greatly. As darkness fell, the clouds overhead parted and we got a good glimpse of the summit of Argonaut. Careful map study revealed that we were indeed off-route from the usual approach. However, we were on the true NW aspect of Argonaut. 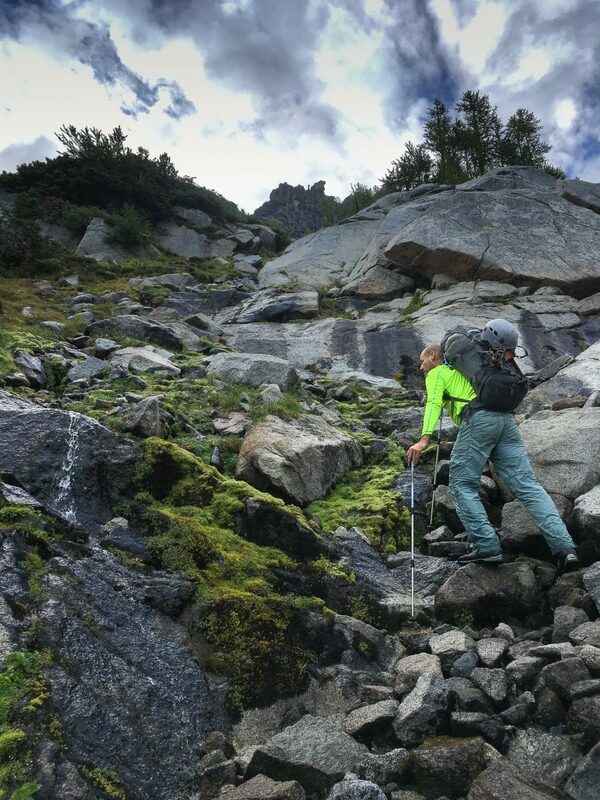 We discussed descending back down into the boulder field and getting back on the known route, however this wasn’t too appealing. 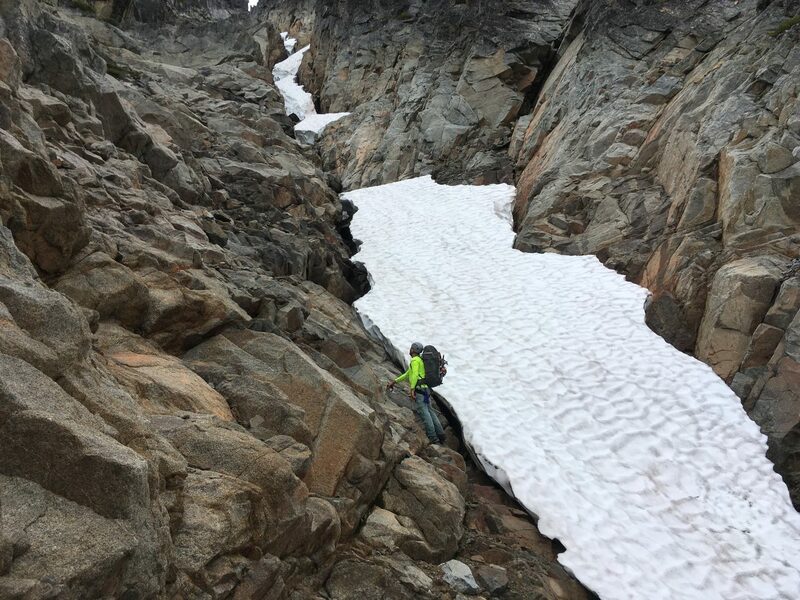 We read in another trip report that the late season approach has some unsavory slabs and discontinuous steep snow with potential moat issues. We decided that after a night of rest here we would continue our approach upwards, looking for the path of least resistance. The next morning we broke camp at first light and were on the move by 7am. The weather looked promising with clear skies overhead. The hiking was very straightforward – mainly class II terrain, with a few class III-IV moves here and there. We didn’t have to climb any slabs and avoided the snow all together. Scramble up from camp to the NW Arête. After 2 hours of upward progress we found ourselves on a small ridge, very close to the start of the NW Arete. We could see down the other side and found we were above the steep snow gully that is the usual approach. We were glad that we avoided having to ascend that route. The snow was certainly discontinuous, with areas of loose mud and rock that would have been quite unstable given the rains of the previous day. 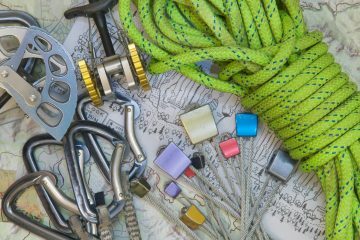 The route description by Tom Unger was a helpful resource, though we frequently questioned if we were “on route.” As is common with moderate alpine climbs, there are many options which all likely lead to the same general destination…usually…you hope. Unger’s description lists 5 pitches. We ended up doing more like 7 or 8 pitches to minimize the drag, deal with the weather that we faced, and to facilitate good communication. A few hundred feet below the start of the NW Arête. Pitches 1 and 2 were pretty straightforward. We found blocky climbing and stayed near the ridge crest. At the top of the second pitch we found ourselves on a narrow ledge with a few options. I chose to traverse pretty far out right here – maybe 50’ from the belay. 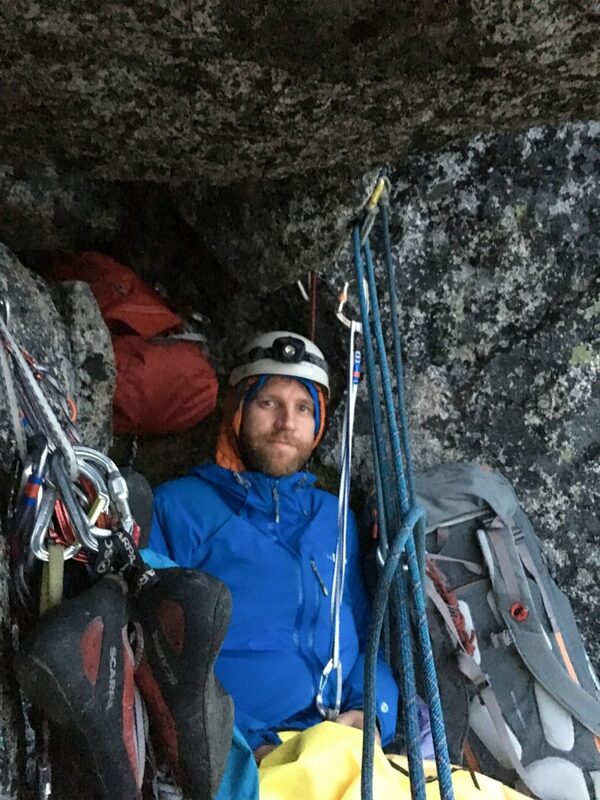 I found a steep crack system with good holds and pro, which I took up to a very large ledge with evidence of a previous bivy. I chose to belay here, as the weather seemed to be changing rather quickly. Clouds were moving in and within seconds, the north ridge of Stuart across the way was completely obscured from view. Just as Eddie made it up to me, the snow began to fall. 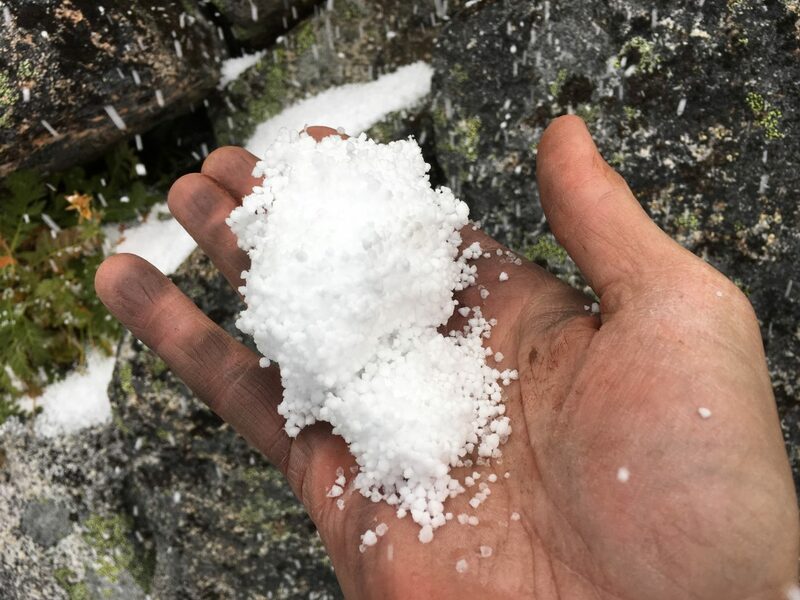 It was a full-on graupel downpour. We were quite entertained initially, thinking it would pass within a few minutes and we would proceed without any issues. The snowfall increased in intensity and we noticed accumulation in the cracks at an alarming rate. Eddie wanted to continue climbing and he made a few false starts up the right side of the ledge, but backed off due to slick conditions and cold hands. He then traversed left on the ledge up easier blocky moves, then made a careful traverse back right on a narrow snow-covered ledge, which led to an obvious way upwards. However, due to the now wet lichen-covered rock, cold hands, and generally miserable conditions, he found the climbing quite difficult. I lowered him back down to me on the large ledge. We took shelter under a rock, brewed up some tea, and discussed our options. We figured we had 3 or so more pitches of climbing, and 4 hours of remaining daylight. During this discussion, the precipitation let up, the clouds overhead lifted a bit, and so did our optimistic spirits. I gave this next pitch a go – and was able to aid up the slick rock, past the move that had given Eddie so much trouble. The climbing was much more difficult now. Most of the NW Arête is made up of black lichen covered granite. When this lichen is wet it turns into a slippery mess akin to climbing on rock covered in wet lettuce. I neglected to mention that this route also necessitates a carry-over, and we were each climbing with full packs of overnight gear…fun times! Eddie is a Brit and has encountered climbing conditions like this before in Scotland. He jokingly suggested that we put on our socks OVER our climbing shoes in an effort to increase the friction under foot. I laughed at this idea, but now in retrospect maybe we should have attempted this (it could work similarly to the felt-bottom boots used by fly fisherman to wade in streams.). I decided to lead and was able to do an aid move past the section that had given Eddie so much trouble. We slowly made it up a couple more slippery pitches. Eventually I found myself leading out on a large left-leaning flake. It was slick and I couldn’t place any protection above the traverse. Upward progress required a step-across from the flake into a steep crack system. The trouble was that I really didn’t trust my footing on the slick rock and I had no pro in above my stance. In a desperate attempt to improve the situation I slung the flake below me, to add a bit of protection before the step-across. The sling pulled right off the flake as I moved passed it. I tried weighting the sling with a couple of biners. Again, the sling pulled off. I made my way back down to Eddie to discuss the situation. We rigged up a stuff sack filled with a rock, and Eddie volunteered to lead. He used a larger sling on the flake and clipped the rock sack to it. The sling stayed in place this time, and Eddie made the step into the crack system. He found good pro and handholds and made it up the crack. By the time I joined him at our next belay, it was getting quite dark. The clouds were back in full force and we were awash in a fog. We donned our headlamps and continued upwards, hoping that the summit was just above us, with possible ledges for a bivy. I haven’t done much technical climbing in the dark. I also haven’t done much trad leading in the dark. It adds a whole other dimension of difficulty that I had never fully appreciated before this outing. Needless to say, our upward progress slowed to a mere crawl. I was 30 feet above Eddie when I spied a cave-like ledge down and to my left. I shouted down to him that this might be our best option for a safe bivy. He agreed and lowered me into the alcove. It was much smaller than I had originally imagined. Eddie climbed up to me and we discussed our options once again. It was around 10pm and we were tired, cold, and damp. Though this spot was cramped, it offered a bit of overhead shelter and was relatively dry. We both agreed that to continue to climb would be more dangerous than an uncomfortable night spent here. 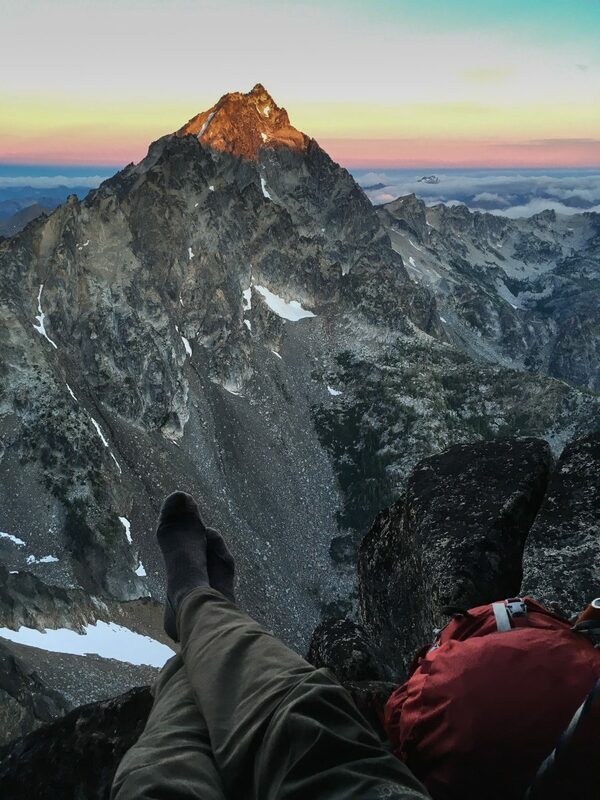 We began the tedious process of sorting through our gear, getting out the tent, sleeping bags, pads, etc…The ledge wasn’t large enough for us to both be standing at the same time, and it had no place to set anything down. We rigged up some fixed lines and hung our gear on the wall. We crawled into the tent, using it as a large bivy sack. We warmed up and began a fitful night of shifting around in this little alcove. 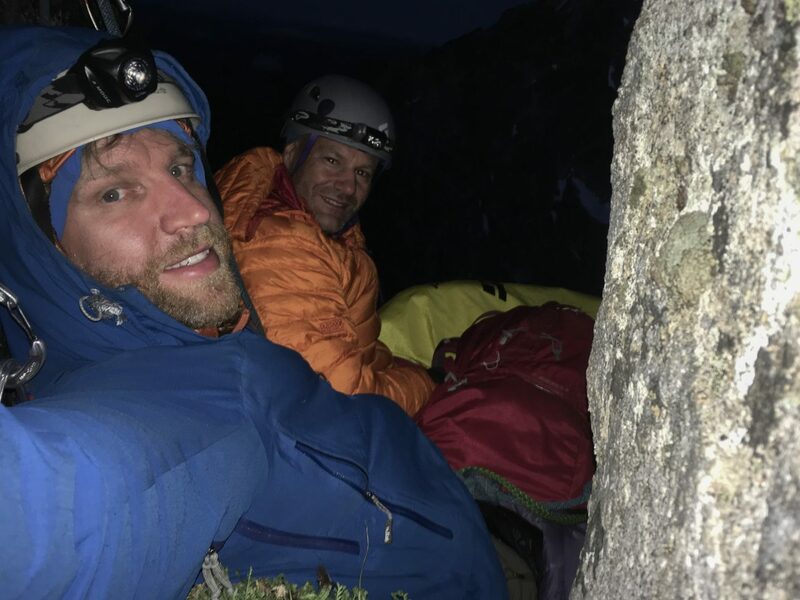 Neither of us have done any big wall climbing or slept on a portaledge before, but we can imagine that this was somewhat similar. However, this was probably worse, as we literally didn’t have any truly flat ground to rest on. The small ledge was downward sloping out towards the cliff face. It wasn’t large enough to lie down, and one person’s outer leg just hung over the abyss below. The only thing that kept us in place was our anchored harnesses. Hours of hanging in the harnesses made for sore spots. Then the rats began to pester us. Yes that’s right, there were rats crawling around us looking for a late night snack. Who would have thought that at 8500’ on a cliff face, there is an active population of rodents? They were bold and hungry. Sleep was difficult to achieve in this spot. Just after midnight, the clouds parted and we were treated to a star-filled sky and the magnificent silhouette of the north ridge of Stuart. We brewed tea and ate oatmeal and were surprisingly happy to be in this unique position, uninjured after such a long and challenging day. 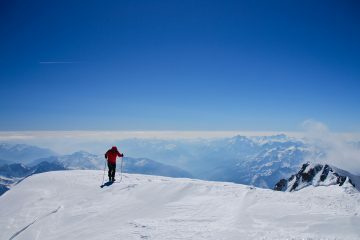 We topped out on the sunny icy summit of Argonaut the next morning at around 7am. We basked in the warmth and signed the summit register. 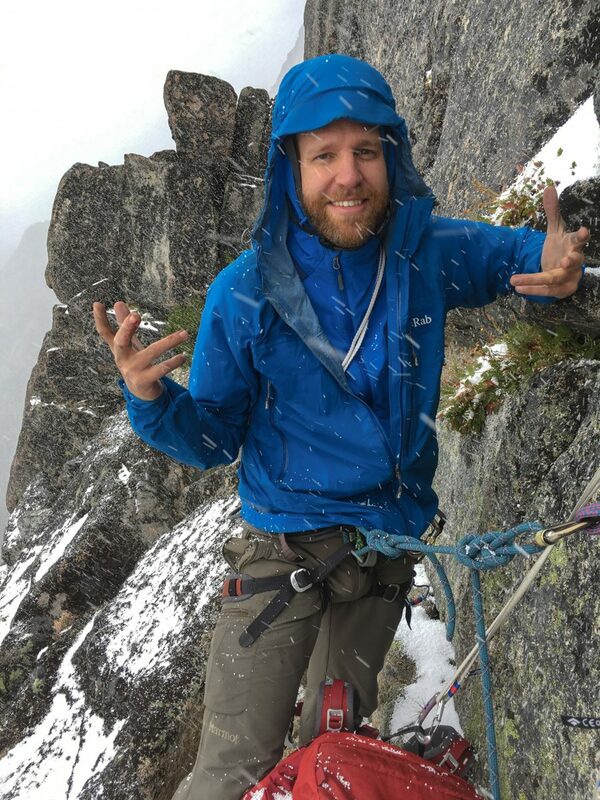 Our descent down the East Ridge was uneventful and we found the various rappel stations as hoped. 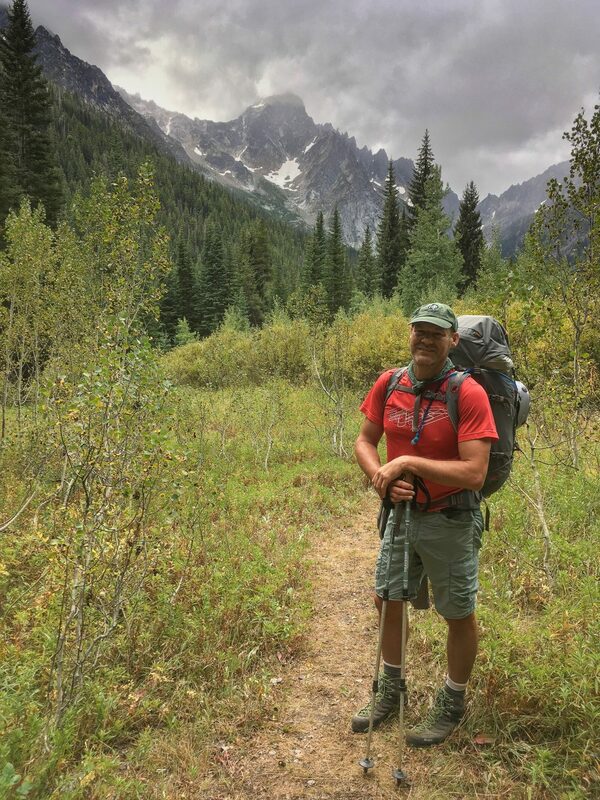 It took around 4 hours to get off Argonaut and begin traversing over towards Colchuck. Final icy scramble up to the summit of Argonaut. Colchuck and Dragontail as seen from Argonaut Peak. By 3pm we were looking down the Colchuck glacier. We decided to drop our packs and make a quick scramble up to the summit of Colchuck proper, since neither of us had tagged it previously. What a magnificent view of Argonaut from up there! By 4:30pm we were heading down the Colchuck glacier. There were 4 inches of fresh snow on the upper 1000’ of the glacier, making the travel interesting. The rocky terminal moraine was as tedious as we had read. The hike down the trail seemed to take forever, and we donned headlamps for the final 3 miles. It was around 9pm by the time we were back at the car, and we were mighty tired. Please see this link argonaut-nw-arete for a PDF map of the route taken. View of Argonaut from the summit of Colchuck.